↑ Also Den Bosch in Dutch. ^ ا ب Amsterdam is the national capital of the Netherlands. 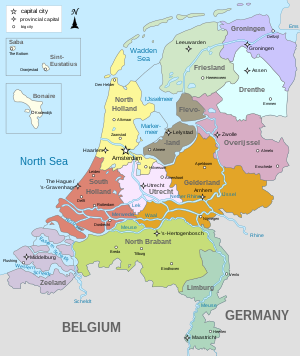 Haarlem is, however, the capital of the province in which both Amsterdam and Haarlem are situated. ↑ Den Haag or ​'s-Gravenhage in Dutch. The Dutch parliament and the Dutch government are located in The Hague along with the Supreme Court and the Council of State.